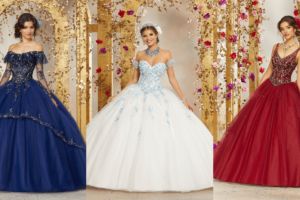 The last accessory on your list will be your quinceanera bouquet. You probably weren’t even considering it as an accessory, but it is! Make sure you customize it to your personality and theme so it appears flawless in every photo taken. Ready to customize your quinceanera bouquet and make a statement this winter? The following breathtaking ideas won’t disappoint! Adding poinsettias, pine cones, holly, evergreen boughs, and red winter berries will give your quince bouquet a festive winter touch. You may choose roses but keep in mind that they will be expensive since they will be out of season. Spray some artificial “frost” purchased from your local discount store to go all out! No Need for Fresh Flowers! Are you struggling to find the freshest flowers at your local shop without spending much? Instead of stressing yourself and wasting gas driving from shop to shop, use artificial flowers. Purchasing artificial flowers created with a silk-like material will be your best bet so your bouquet appears classy! Click here to purchase from Etsy! Crystal chandeliers, crystal vases for your centerpieces, your glass heels….all you need is a crystal bouquet to complete your princess look! Click here to purchase at Etsy! Want to have the most unique quinceanera bouquet? Instead of using traditional flowers, feathers will be just as breathtaking! Combine blue and white feathers, sparkly pins, and pearls for your Winter Wonderland themed Quince. Add a touch of personality with brooches! The newest trend in quince bouquets is customizing it with brooches. It’s a great option because you won’t have to worry about your flowers drying out during your event and you can treasure it forever! Are you the queen of origami? Use your skills to design your very own vintage quinceanera bouquet! Mix in some natural flowers that won’t take away from your creation, such as angel’s breath, and wrap a delicate ribbon around it. We guarantee your guests will be wondering where you purchased it! If sparkles, glitter, and girly colors rule your closet, you must show that off in your bouquet! Purchase a dozen of inexpensive flowers, such as lilies, and Swarovski crystals from your local crafts store to mimic the bouquet below. To spice it up with color, leave a couple flowers soaking in the food coloring of your choice. Last, but not least, decorate the stem wrap! This is your chance to make a lasting impression! Decorate your quinceanera bouquet’s stem wrap with anything that best represents you. The one below is perfect for a butterfly quince theme but if you’re having a Winter Wonderland quince, you may want to substitute the butterflies with snowflakes. Make sure the stem is comfortable enough for you to hold the entire day and take pictures. Now that you know how to beautify your bouquet, it’s time to put those hands to work!